Hong Liu is on a mission to restore Florida’s endangered cigar orchid population. The conservation ecologist and professor in the Department of Earth and Environment is part of a national restoration team working to resupply genetic diversity to the cigar orchid population in Fakahatchee Strand Preserve State Park, a forested swamp spanning 20 miles along Florida’s west coast. 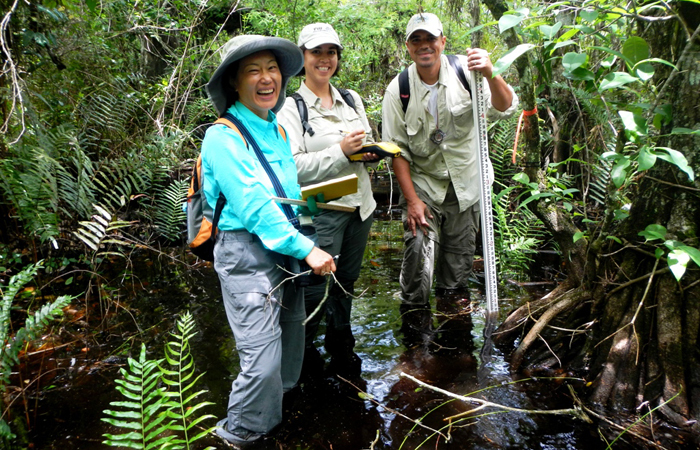 Hong Liu (left) and her students Haydee Borerror (center) and Jason Downing (right) collect data in the Fakahatchee Strand Preserve State Park. Started by the Atlanta Botanical Garden in 2006, botanists grow cigar orchids in a controlled setting in Atlanta, bring the young orchids to the Fakahatchee state park, and, finally, strap them on to cypress and pop ash trees in order for them to root and reproduce. Liu’s lab is tasked with implementing experiments to determine the optimal conditions for the orchids’ survival and growth. Her lab is also conducting population viability analysis to ensure the orchids are being restored at a rate that will sustain a healthy population for the next dew decades. Haydee Borerro ’13, an environmental studies graduate student, has worked alongside Liu in Fakahatchee for more than a year. She has been involved with out-planting juvenile orchids and data logging to track their success. On her first day at Fakahatchee with the research team, Borerro spotted a new flowering cigar orchid individual in an area that is known to have less than 30 individuals of flowering size. The research team named the area Haydee’s Prarie in her honor. The restoration project is midway through completion. Six hundred and fifty orchids have been transplanted and planted. An additional 350 were planted this month. The orchids are being monitored for survival, growth, reproductive attempts, and diseases or insect infestation. The efforts have been successful thus far, with orchid survival rate ranging from 50-85 percent. The long-term restoration project will continue to carry our supplemental outplants to maximize the population’s genetic diversity. The cigar orchid, also known as cowhorn orchid or bee-swarm orchid, is North America’s largest and showiest native orchid. Once abundant in the Everglades and the Big Cypress Swamp, it is now listed as an endangered species by the state of Florida due to excessive collecting and logging activities spanning more than seven decades. More native orchid species grow in Fakahatchee Strand Preserve State Park than in any other place in the North American continent. Liu earned a Ph.D. from FIU in 2003. She joined FIU faculty in 2008 and teaches courses in restoration ecology and the ecology of South Florida. Liu also has an appointment as a research ecologist with the Fairchild Tropical Botanic Garden’s Center for Tropical Plant Conservation.